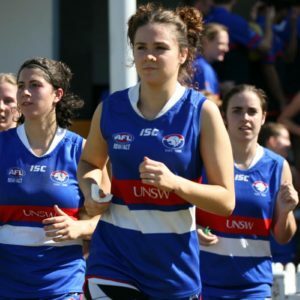 A stint in defence has helped Newtown’s Laura Holdsworth with her confidence in attack as she kicked six goals in her side’s win against the Western Wolves on the weekend. 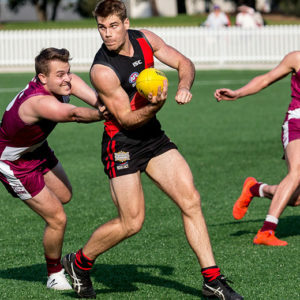 Holdsworth kicked a personal best six goals, six behinds to guide the Breakaways to a 67-point victory on Saturday morning at Picken Oval. 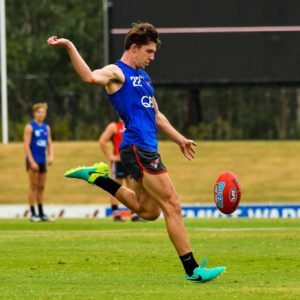 The 30-year old was recently selected in the Northern Giants squad for the AFLW Winter Series against the Gold Coast Suns, Brisbane Lions and Southern Giants. Holdsworth, who has played her entire career as a forward, was trialled by the Northern Giants in defence. “It was interesting, they (the Giants) put me in the backline. I’d never played there before so it was a learning experience, that’s for sure,” said Holdsworth. “It was really good because I’ve always played forward so I got a real appreciation for defenders. It definitely kept me on my toes and I’ve still got a bit to learn but I enjoyed it. Coming back to local footy, Holdsworth has returned to more familiar territory in the forward line, but believes being part of the defensive squad at the Giants has had a positive effect on a number of aspects of her game. The forward booted goals from all different pockets of Picken Oval including a goal from 40m out on the boundary. Briggs was also a standout in the weekend’s game kicking three goals of her own, meaning the duo contributed nine of their sides’ 10 goals. As a small forward, Briggs dominates in quick play running onto the ball with speed and using her agility to dodge and weave opponents. However, Briggs also has the capacity to take a strong overhead mark as was shown on the weekend. Briggs took a number of marks from Wolves’ kick outs delivering the ball forward again for her team. This happened three times with two of them resulting in goal assists to Holdsworth. It all came together for the Breakaways in what was an even performance all round. Defenders Francesca Hocking and Anna Ruut were outstanding all game. Jayne Macklin was solid in the ruck and the Breakaways’ quick delivery into their forwards worked a treat. 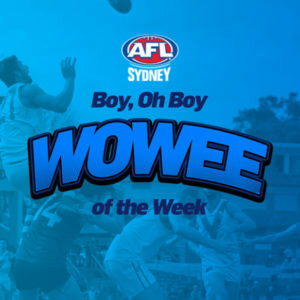 For the Western Wolves it was unfortunately a day to forget after what has been a great run by the team in recent rounds. They missed Rebecca Miller who didn’t play on the weekend and captain Melissa Freckleton received a couple of heavy knocks – one in the first minute of the game and one in the last minute. To their credit, midfielders Amelia Causley-Todd and Cassandra Emery didn’t give up and gave their best all day as did Belinda Harrison. All matches this round were one sided on the scoreboard. UNSW Eastern Suburbs Bulldogs (13.5.83) defeated Southern Power (2.4.16), Macquarie Uni (6.10.46) defeated UTS Shamrocks (1.5.11) and surprisingly the Sydney University Bombers (12.4.76) defeated Auburn Penrith (3.2.20) by 56-points. 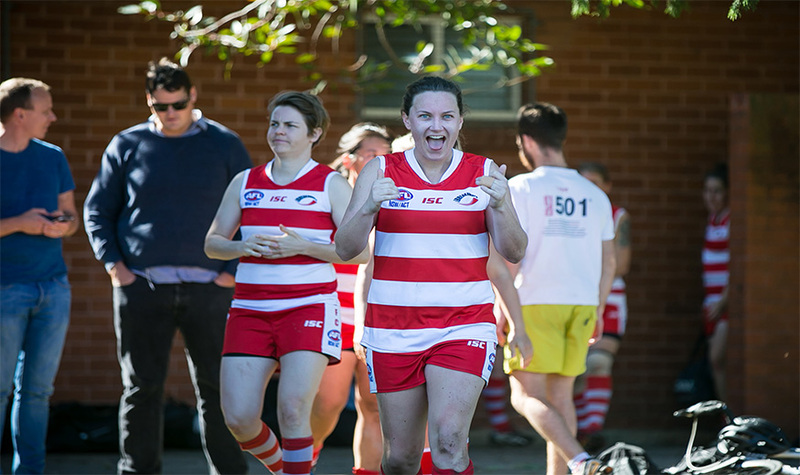 UNSW Eastern Suburbs’ Rebecca Privitelli sits clear on top of the goal kicking tally on 19 goals having booted five in her match on the weekend.